According to the Wyeth website, Centrum is a multivitamin, made by Wyeth, which is now owned by Pfizer pharmaceuticals. Centrum multivitamins have been produced since 1978 and maintain strong bones with Vitamin D and calcium, supports immunity with antioxidants, supports energy production, and supports muscle and nerve function. 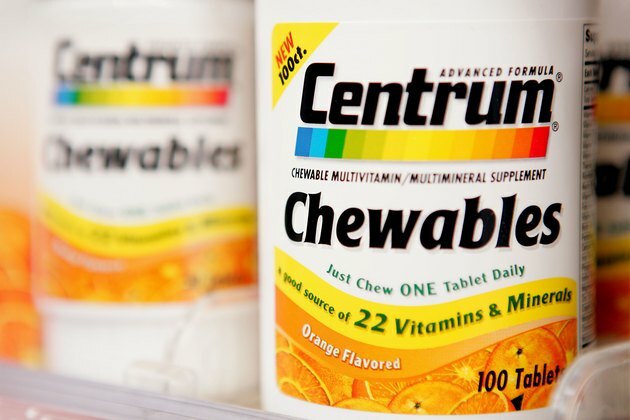 Centrum contains the following vitamins per one tablet serving size, according to the package label listed on the Centrum website: Vitamin A 3500 IU, Vitamin C 60 mg, Vitamin D 400 IU, Vitamin E 30 IU, Vitamin K 25 mcg, Thiamin 1.5 mg, Riboflavin 1.7 mg, Niacin 20 mg, Vitamin B6 2 mg, folic acid, 400 mcg, Vitamin B12 6 mcg, biotin 30 mcg and pantothenic acid 10 mg.
Centrum contains the following minerals per one tablet serving size: calcium 200 mg, iron 18 mg, phosphorus 20 mg, iodine 150 mcg, magnesium 50 mg, zinc 11 mg, selenium 55 mcg, copper 0.5 mg, manganese 2.3 mg, chromium 35 mcg, molybdenum 45 mcg, chloride 72 mg, potassium 80 mgc, boron 75 mcg, nickel 5 mcg, silicon 2 mcg, tin 10 mcg and vanadium 10 mcg. Centrum contains the following ingredients, according to the package label listed on the Centrum website: calcium carbonate, potassium chloride, dibasic calcium phosphate, magnesium oxide, microcrystalline cellulose, ascorbic acid, ferrous fumarate, pregelatinized corn starch and dl-alpha tocopheryl acetate. It contains less than 2 percent of acacia, beta-carotene, BHT, biotin, boric acid, calcium oantothenate, calcium stearate, cholecalciferol, chromium picolinate, citric acid, corn starch, crospovidone, cupric sulfate, cyanocobalamin (Vitamin B12), FD and C Yellow No. 6 Aluminum Lake, folic acid, gelatin, hydrogenated palm oil, hypromellose, manganese sulfate, medium chain triglycerides, modified food starch, niacinamide, nickelous sulfate, phytonadione (Vitamin K), polyethylene glycol, polyvinyl alcohol, potassium iodide, pyridoxine hydrochloride (Vitamin B6), riboflavin (Vitamin B2), silicon dioxide, sodium ascorbate, sodium benzoate, sodium citrate, sodium metavanadate, sodium molybdate, sodium selenate, sorbic acid, stannous chloride, sucrose, talc, thiamine mononitrate (Vitamin B1), titanium dioxide, tocopherols, tribasic calcium phosphate, Vitamin A acetate and zinc oxide. It may also contain greater than 2 percent of ascorbyl palmitate, maltodextrin, sodium aluminosilicate and sunflower oil. What Ingredients Are in Tamiflu?